Explosive in 2005, and one match from the record. What a year! Tennis seems healthy...except for the players, that is. Even though it did not begin or end predictably, the men's tour saw the talented Mr. Federer post the most dominant season since Johnny Mac in 1984. In the end he ran out of gas just one match from equaling Mac's incredible match record of 82-3. Different eras, different temperaments, but similar records based on graceful all court games with deceptive court coverage and power. Mary Pierce reached 3 big finals�the surprise of 2005. The women's tour? Instead of the further emergence of young Russians...it was a splitting of the Slams between the two Belgians and the two Williams girls, plus few surprises from les dames francaise. Let's start with the re-focused Mary Pierce. I've never been a fan per se, but watching her reach two slam finals then almost pulling off a huge win in the final of the WTA's year-end championships, you'd think it was VH1's I love the 90's -- tennis edition. She's fit again, and with balance and poise she comes to the net to finish points. On the baseline, she made her opponents (including defending champ, Justine Henin Hardenne at the US Open) look and feel rushed. Her Belgian conquerors in the Roland Garros and US Open finals deserve a lot of credit, too. Justine outclassed her 6-1, 6-1 amid cries of "Allez Marie" in Paris. Then at the end of the summer, another comeback kid, Kim Clijsters weathered her power nicely in a tougher-than-the-score-indicates 6-3, 6-1 performance for the New York crowd. Relief after winning the biggest thing next to a Slam. At year's end, it was Amelie Mauresmo finally shedding the choker label (barely). Amelie knelt at the end of the 6-4 in the third epic, and the relief was palpable. One of the most lauded all-courters in the women's game had just exorcised her demons and won something big. I think she's good for a Slam next year. Of course, I say that every year (but this time I'm not really going out on a limb). How can we forget the Williamses? Venus cagily took Wimbledon, conquering two fellow former champions -- Sharapova in the semi, then Davenport in a closer than close final. Venus showed a lot of character and tempered her usual blazing shotmaking with a touch more variety and defensive nuance. Translation: she knew when to play the pusher role, and it worked at just the right times. It wasn't time to forget the Williams sisters, just yet. Can you believe it was just ten months ago that Serena won the Australian Open over Davenport? 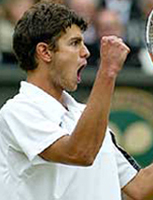 And the same for the (now injured) Safin, who overpowered Hewitt the same weekend (more on those two later). Serena showed us so much impatient tennis in 2005, that in the eyes of the women's tour, she is no longer scaring anyone. Word is, she is getting fit again for 2006, thanks to the realization that her lack of conditioning and the abundance of stress on her joints made the rest of 2005 a debacle. On the men's side, outside of Roger Federer: the rest of the top players Safin, Hewitt, Nadal, Roddick and Agassi, never made it to Masters Cup. There was Safin with his knee problem, Nadal with what could be a two-month foot ailment, Roddick with back spasms, Andre with the ankle and back pain. Ironically, the tour's resident angry young man, Lleyton Hewitt had the happiest reason to not play -- the birth of his daughter. Unexpected faces in Shanghai: Nikolay Davydenko, Gaston Gaudio and Mariano Puerta. A surprising tournament and a surprising final. As a result, Shanghai got to host more alternates than regular qualifiers. The Masters Cup cast: Ivan Ljubicic, David Nalbandian, Nikolay Davydenko, Guillermo Coria, Fernando Gonzalez, Gaston Gaudio and Mariano Puerta joined Federer. The Chinese people got a healthy dose of Spanish as two of the four semifinalists flew the Argentine flag. Nalbandian looked surprisingly dominant against an in-form Ljubicic in the last round robin match. 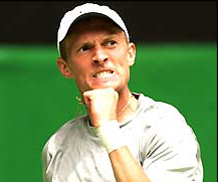 He then picked up where he left off as he straight setted Davydenko in one semi. Federer displayed otherworldly dominance as he double-bageled Gaston Gaudio in the other semifinal. On a tournament plagued with withdrawals, the final needed to be something special -- and the players did not disappoint. David Nalbandian gave a good account for himself dropping the first two sets in tiebreakers. Then, as Federer began to show signs that he had not played in six weeks, and that his fitness was suspect in long matches, Nalbandian took over, and played with two and a half sets of purely dominant all-court tennis. Federer could have graciously packed it in at 1-4 in the fifth. Instead, he dug deep, and fought admirably all the way to match game at 6-5. 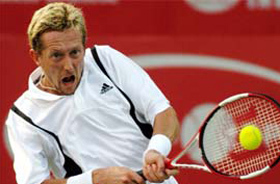 But Nalbandian steadied his nerves, broke back and played a rock solid tiebreaker, taking it 7 points to 3. The pride and confidence Nalbandian takes from this win surpasses the million and a half he earned. The question is, will he get complacent or will he use his diverse game and improved fitness to threaten Federer and Nadal in the Slams in 2006? Will we hear from some new players in 2005 and/or Martina Hingis? Looking into 2006, Federer begins a click or two lower on the "invincibility meter", but he's still got to be thrilled with his 2005 effort. He finished the year comfortably on top of the rankings and is positive about his chances to actually improve! If anything, the four times he lost a match in 2005 will actually inspire him to throttle Safin, Gasquet, Nadal and Nalbandian throughout 2006. In his words, "Ja ... motivation is sky high." I'm actually bullish on Roddick and Hewitt for the upcoming Australian summer swing. Roddick's back is absolutely fine and he's been practicing in Austin, playing exhibitions and keeping positive. Hewitt's paternity leave gave his wheels some valuable recovery time, and now, he's home with a head start on training for his home Slam. The staff of WTA and ATP trainers (I understand they're in hiring mode). Think back to the 1980s when Sweden, the US and Germany were the dominant tennis powers in Davis Cup. Now, think again. This year's final featured two nations that did not officially exist when the players on their teams were in the juniors. Croatia and the Slovak Republic earned a final showdown after upending powerhouses Spain, Russia and the USA. The Slovaks, led by Dominik Hrbaty, gave a good account for themselves, splitting the first day, but Ancic and Ljubicic (who hold the distinction of being the only team to ever beat the Bryan twins in Davis Cup) were just too strong. 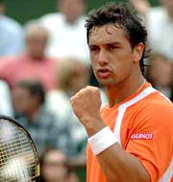 After winning the doubles, Ancic went on to seal Croatia's emotional victory with a decisive win over Michal Mertinak. Though the final was not a ratings winner, for those of us who actually did witness the matches, it was fabulous to see the Croatians (and the inspiring fifth man Goran Ivanisevic) celebrate a victory that was a very big deal to them, if not the world sporting media. Big in Croatia: Ivanisevic, Ancic and Ljubicic. The US team is seeded again this year and hosts Romania in the World Group's round of sixteen in February. It's at least possible the U.S. could be back in contention, given a roster featuring Roddick, the Bryans and the maturing Robby Ginepri and James Blake. If Davis Cup was below the media radar, what can we say about Fed Cup? In case you didn't know (and you probably didn't) Roland Garros was the site of the 2006 final, and the tennis displayed by the French and Russian squads did not prove worthy of its surroundings. Amelie Mauresmo could not get enough balls past Elena Dementieva in the first singles match. Her teammate Mary Pierce played a more aggressive and hungry brand of tennis than her singles opponent, Anastasia Myskina, to level the singles. Which brought us to the decisive doubles match. Dinara Safina: inspired play at critical moments was the difference. The word 'decisive' applies to the match, but not to the tennis. Doubles today often departs from the attacking ethos, giving way to more to two back and a whole lot of the one up / one back formation. The match up was Dinara Safina and Elena Dementieva against Pirece and Mauresmo. Each team featured one banger (Safina and Pierce) and one capable volleyer (Mauresmo and Demetieva). But both "volleyers" had real trouble putting balls away at net. Sadly, volleying ain't what it used to be. Part of the reason is the pace and disguise on groundstrokes today. Part of it is that a decent short volley is often retrieved and rifled back these days. And part of it is that it's hard to be good at something if you never do it. What won the doubles for the Russians? Dementieva's consistent retrieving and some inspired play from Dinara at critical moments. In the third set, her occasional poaching and her improving serve caused the French girls to hit some really indecisive returns and groundstrokes. Her brilliantly disguised forehand also had Mauresmo looking downright slow at net. As with Nalbandian, the week could be a springboard week for Dinara or a spiral into complacency. If she can take movement cues from her teammates and brother, and refine her finishing skills in the forecourt, I think we've got a top tenner here (in singles and doubles). 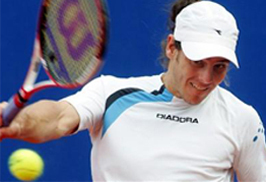 Tennis' sick man got a shot in the arm, as the ATP backed off its radical changes. They've decided to use traditional, regular scoring to appease the purists and a 10-point TB as the third set to woo more singles players. It's easy to sit here and be critical of the ATP, be critical of doubles specialists, and be critical of any changes anyone makes to try and right the ship. Yes, tennis has changed, and not all for the better for doubles. I'm just happy they've come to a reasonable compromise ... and from what I've heard, so are a lot of tour players (except doubles specialists). The fans will eat this up. And the good news for singles players is that they get can potentially use doubles as a fun and competitive way to play the game they love -- at a predictable length. Is this the future of professional doubles? 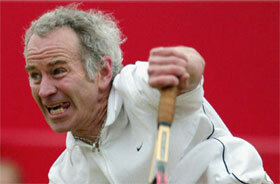 Johnny Mac made the news by entering San Jose with Jonas Bjorkman, proclaiming: "This is not a joke. Jonas and I are going to San Jose to win the tournament." But if I were a player today, I'd be up for a crack at them, that's for sure. Well, I'm looking forward to attending some tournaments in 2006...and reporting back to you. Talk to me in the Forum and let me know if you have any thoughts, comments or questions. Tennisplayer.net Tour Editor, A.J. Chabria, has played, covered and coached at circuit events all around the globe. 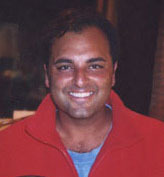 Since 1997, he has been the tennis director at Lakewood Country Club in Dallas, one of Texas' oldest clubs. He also serves as a tester for the USRSA's Master Racquet Technician program. His wife and family are all tennis fans. In 2001, the couple honeymooned in Paris (it just happened to be during Roland Garros).